Shibori patterns are EVERYWHERE right now! I am obsessed with this loose, organic look that’s created through different methods of folding and binding fabric before dyeing. What I didn’t realize is that it is incredibly easy to DIY! Rit Dye invited me to try these shibori projects and share them with you, and I couldn’t wait to experiment! 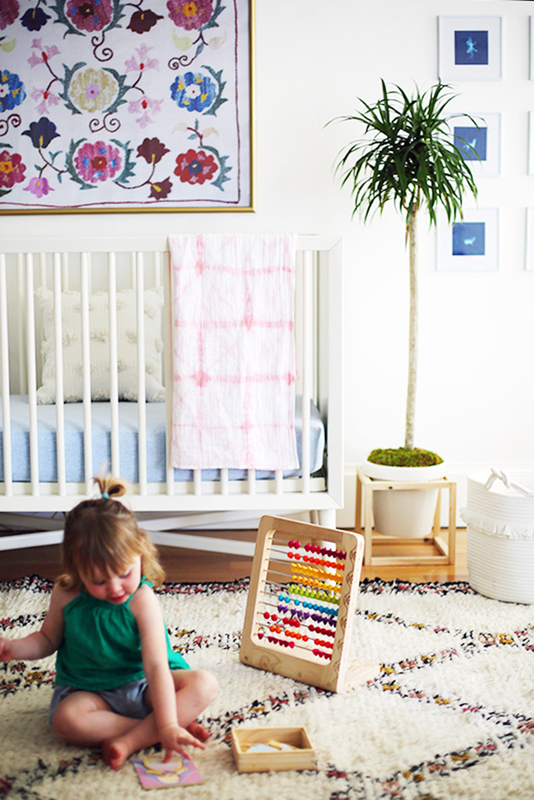 I love Rit Dye, which is completely non-toxic, and use it often for home projects that range from dyeing curtains to overdyeing rugs like the one in this photo. 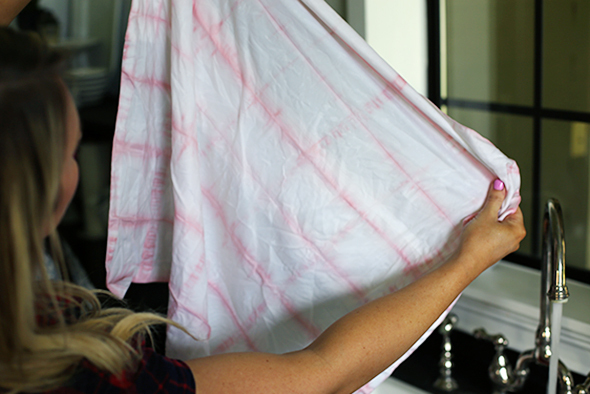 You can use all-purpose Rit Dye on any natural fiber (even wood and paper!) and I always have a selection of colors in my laundry room to refresh dulling clothes, especially black or dark denim jeans. You can grab your bottles in the laundry or craft aisle of practically any store – Michaels, Joanns, Walmart and even my grocery stores all have Rit Dye! There are 32 base colors available in powder or liquid (the liquid is my favorite!). It is SO easy to mix the base colors to make your own custom color! You can even color match to a Pantone color with their custom color formula tool HERE! How genius is that?! These are a couple of formulas that I mixed over the weekend and had great results! I used 100% cotton products in these projects here, but Rit also has a line called Rit DyeMore that works for synthetic materials too (including PLASTICS!). You also don’t have to use items with an all white background like I did here. Just keep in mind, the base fabric color will mix with the dye color to create a new color – the rules of color mixing apply. 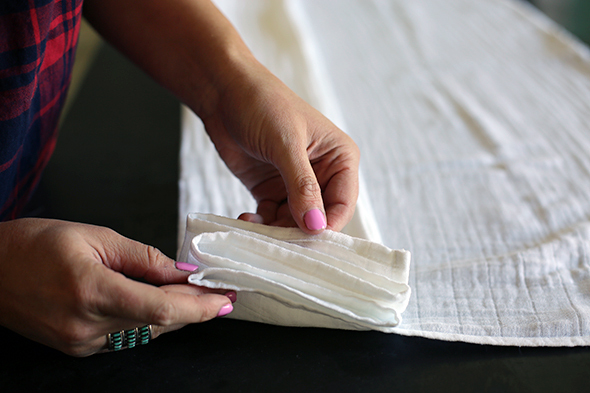 To get started, you’ll have the best results if you wash and iron the item you want to shibori dye. The ironing is not a necessary step, but I liked the patterns of the items I pressed the very best! I used these cotton swaddling blankets and these white cotton pillow shams, though truly, any solid color fabric item will work! There are a million different ways to shibori dye to achieve different patterns (and I can’t wait to try more!) but the two I focused on here are what I’m calling the fold and bind method and the fold and clip method. With both methods, the first step is to fold the fabric item in flat, tight accordion style folds. I have to admit, I was most nervous about getting the folding right at first, but I learned pretty quickly that there’s no need to stress! Do you remember making paper fans when you were a kid? The fold – flip – fold – flip thing? 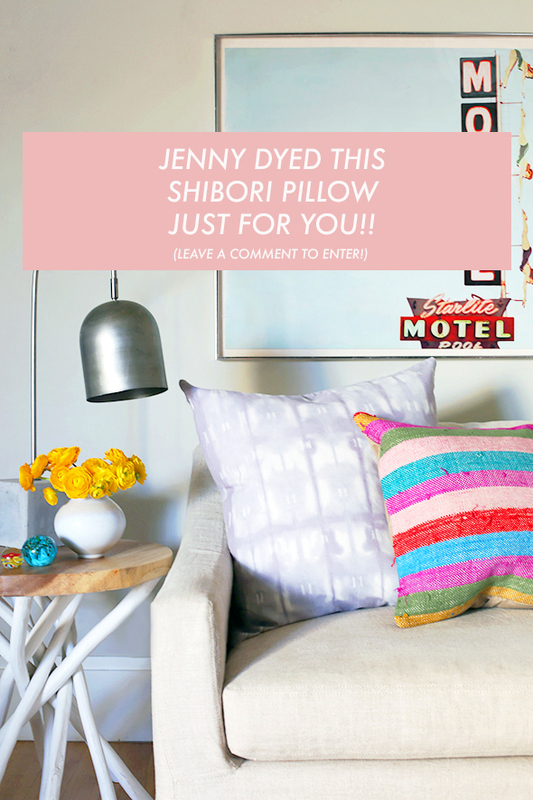 You do the exact same thing with shibori! You literally can’t screw this project up, as long as you accordion fold every time! Just remember that the shorter the length of your folds are, the tighter your pattern will be in the end. For the fold and bind method you’ll want to find two matching pieces of wood or even foam board that will act as the bookends for your folded fabric bundle. The fabric under the bookends will be bound up so tightly that the dye will only soak up around the edges that are peeking out. So pick items for your bookends that are about the size of the pattern you want in the end. Smaller bookends work great for pillows, but I’d use something closer to 4″ wide for swaddling blankets. I used just some random things I found around the house for bookends, though you can easily get craft wood from Michaels or Home Depot that will work great! To see the end result of this pattern using a paint stirrer snapped in half (! ), check out the center green image in the formula round up above! You can use your bookend pieces to help you know how big your folds should be. You will fold it the long way, like a paper fan, and then again the short way (all accordion style folds), so that in the end you have a stacked bundle. You can fold in a triangle shape or a square/rectangle shape. Square folds give you a grid pattern and triangle folds give you an asterisk pattern. Again, the smaller the fold, the smaller the pattern! Triangle fold! I cut two triangle pieces out of foam board for the bookend pieces here. 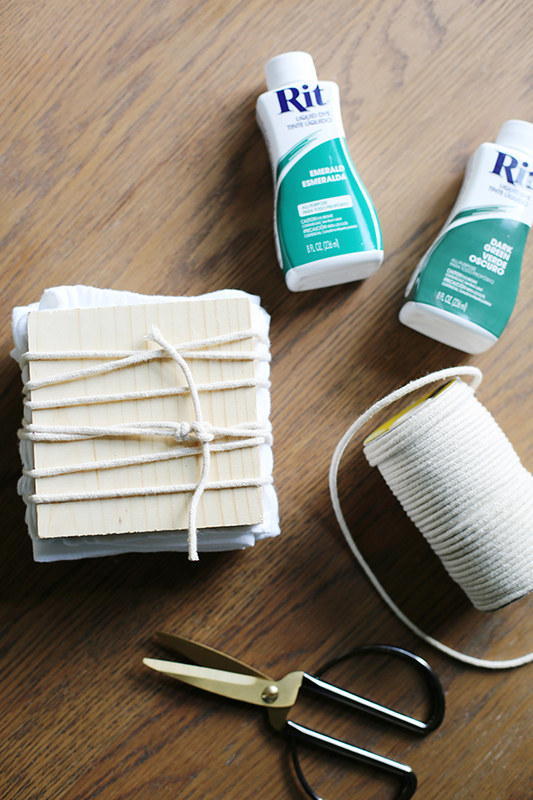 After folding, you place your bookend pieces on either side and bind everything up really well with cotton or jute cording. The pattern will be more distinct if you bind the folded bundle very tightly. This square fold will make a grid pattern. 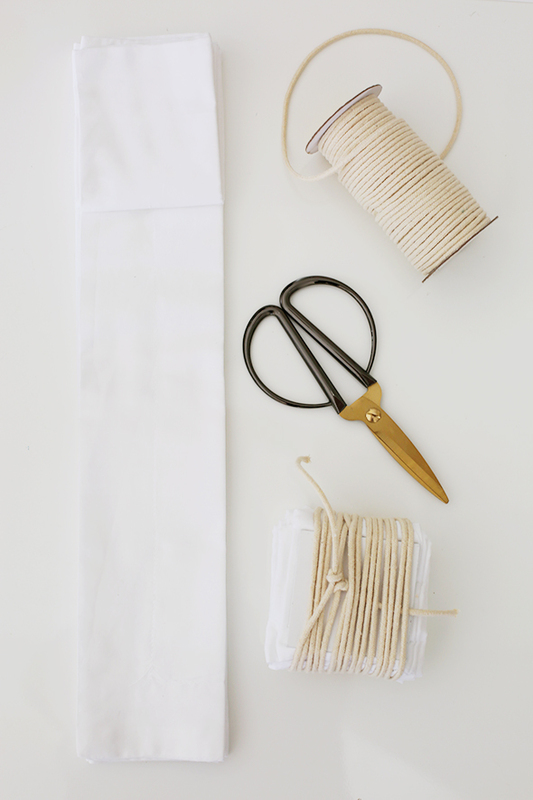 The fold and clip method is even easier! 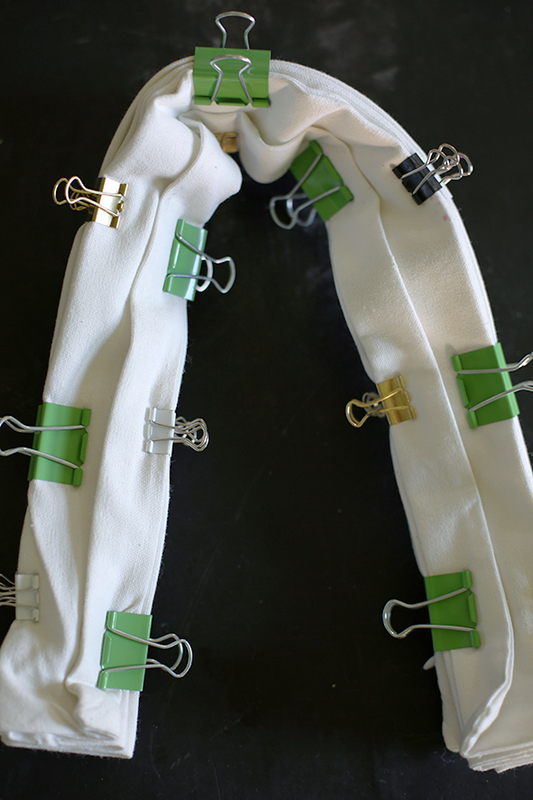 You just fold the long way and then clip the edges with binder clips. My favorite results (like on the lilac gray pillow on my sofa above) were made with a mix of large binder clips and the mini ones! The more clips, the busier the pattern. 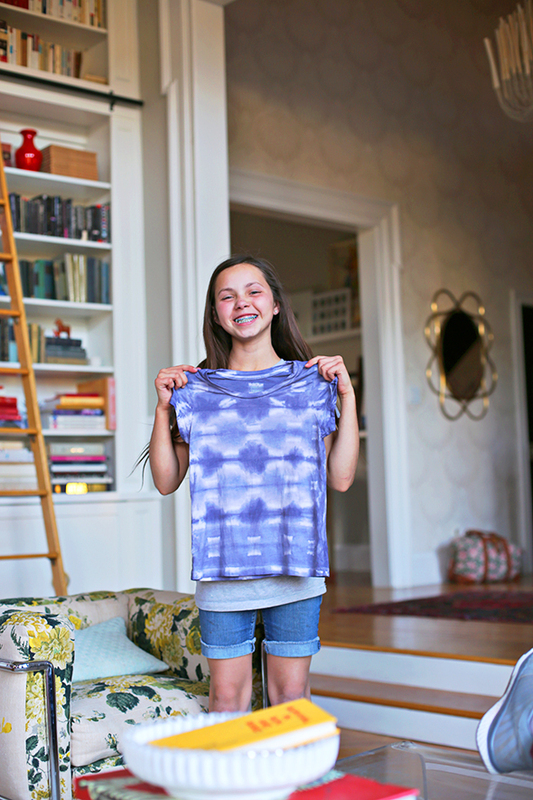 Grace made this t-shirt using the fold and clip method all by herself! She’s 11, guys! Shibori is SO SIMPLE! 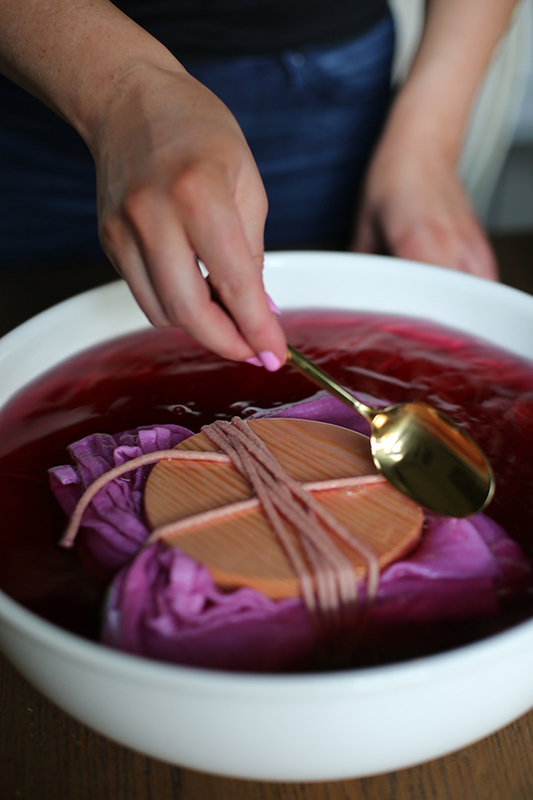 The liquid bottles of Rit Dye make it really easy to make small dye baths. Since Rit Dye is non-toxic and won’t stain ceramic or porcelain sinks or bowls if they don’t have cracks, I just used a big mixing bowl in my kitchen sink. I followed the super simple instructions on the bottle and boiled some water, added salt and played with different combos of colors to get the end result I was after. You don’t have to use huge quantities of dye to get results, especially with these smaller batches. The more dye you use, the more saturated the end result will be. But for some of these lighter pastel colors, I only used about a tablespoon of dye! Even the saturated colors didn’t need more than a quarter cup of dye. 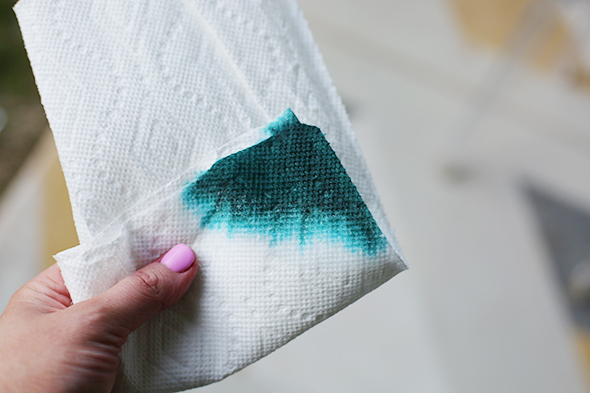 My best tip that I hadn’t thought of before this is to use a paper towel to check the color and saturation while you’re mixing your dye. If it’s not saturated enough, add more dye. Too saturated? Add more hot water. It couldn’t be more simple! The very nice people at Rit Dye also taught me that you can add a touch of Pearl Gray to any of the base colors and it helps to sort of muddy the color up in a way that looks SO pretty. I ended up adding a drop of Pearl Gray to most of the projects here. 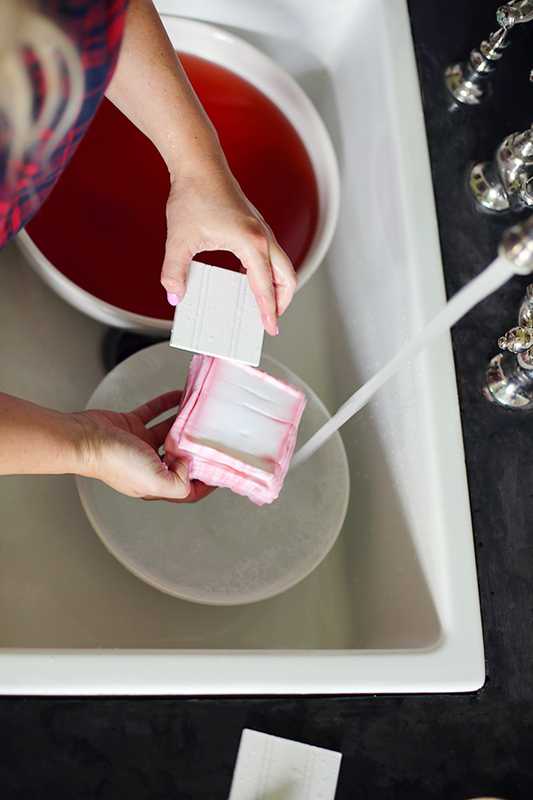 Once your dye color is spot-on and your fabric is folded and bound up, you just submerge the fabric in the dye bath. Obviously, the longer you leave it in, the more saturated the color will be. After experimenting a bit, I figured out it works best to keep the bundles in the dye for only about a minute to keep the bound up part dye-free and to make pattern high contrast. 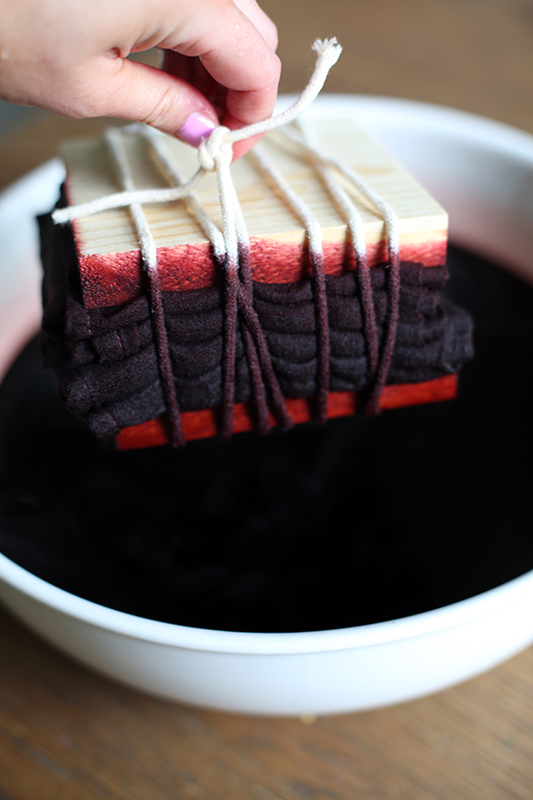 Once you pull the bundle out of the dye bath, rinse it out for a few minutes under cold running water while still bundle up, then unwrap it and give it a really good rinse until the water runs clear. I let this grid pattern (made with the fold and bind method using wooden squares) sit a little too long in the dye bath, so instead of a white center, I got pink. BUT I LOVE IT! That is truly the best part of these shibori projects, you will be surprised at the results every single time! And every single time it looks GREAT! The most exciting part is taking off the binding after the dye has been rinsed out. It’s like unwrapping presents on Christmas morning. 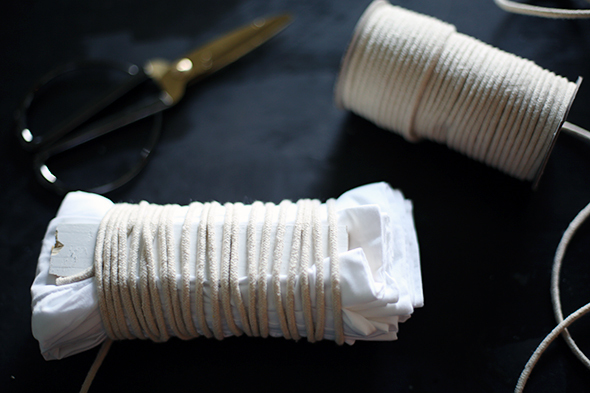 Do you see the soft lines made by cotton cording I used to bind up the squares? SO PRETTY! I love love love the blushy color that I made with 1 quarter cup of Petal Pink, 2 tablespoons of Sunshine Orange and 1 tablespoon of Pearl Gray! 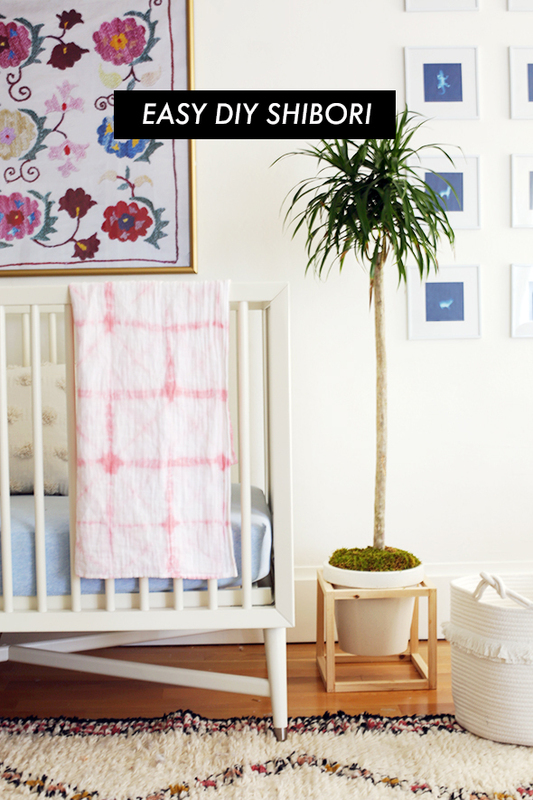 I used it over and over again for tea towels and euro shams for Claire’s room and for a couple of baby blankets, like the one below in Margot’s room. I used a triangle fold on this one for a subtle asterisk pattern! 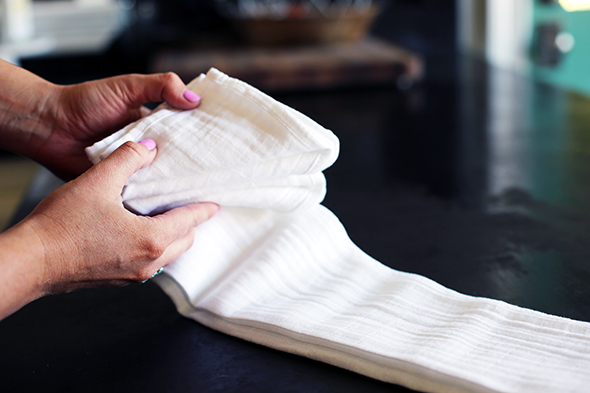 To finish up and set the dye, you’ll just want to run your items through the wash with regular detergent. And that’s it! If you want to go the extra mile, you can you this Rit ColorStay Dye Fixative to help the color set further. I can’t wait for you to try this yourself! I’m warning you though – it’s addicting. I’m dying to get my hands on more white cotton pillows! And in the meantime, I’d LOVE to give away one of the pillows I made today! To enter, leave a comment here with your favorite Rit Dye color and I’ll choose a winner one week from today! Thank you to Rit Dye for sponsoring this post! Learn more about Rit Dye HERE and click HERE to see where you can find Rit Dye near you! Very cool! I love the “recipes” you included! I really want to give this a go myself. oh I am so excited!! I can’t wait to try this!! So pretty! The hardest part of this project for me will just be finding some time! Thanks for such complete instructions. Lovely results! love their Royal Blue color – and the Easter bunny dye project on the site! Love this project. It’s been a while since I have made something…. this may be my next project! I love the Pearl Gray color, very versatile. Thank you for this project; I can’t wait to make some pillow shams. So, hyacinth is my favorite color…but…I just did this with two white canvas pillows and used the Navy RIT dye because it was what was available at my local Rite Aid and I was too lazy/timecrunched to drive the five miles to the craft stores. First of all, holy EASY. Second of all, YES. ADDICTING. I had to stop myself, and it was hard. Every single baby burp cloth I have is getting shibori’d for #2. Also, now I want to shibori placemats and dinner napkins (also a good gift!). 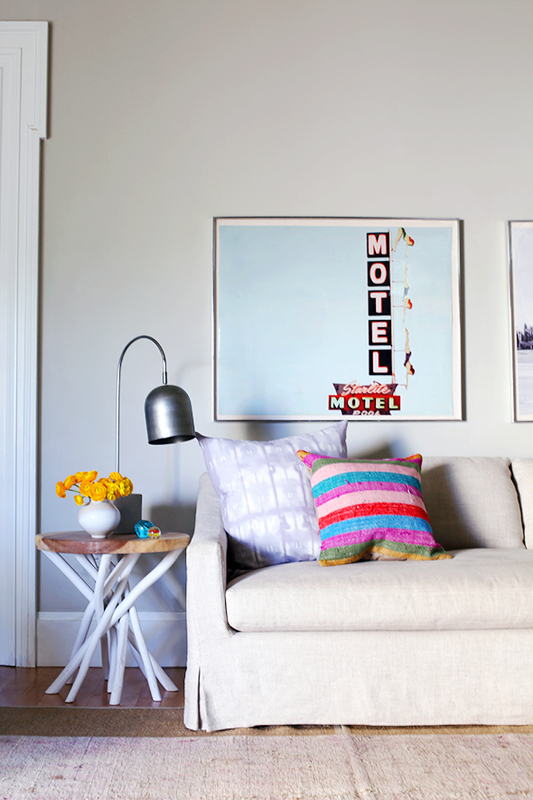 Lastly, did you see the Rebecca Atwood Navy Shibori pillows for $159 each? Now that I know, the pattern is SO EASY to replicate! As for my lessons learned…to get those thin lines, you definitely need a combo of thin fabric and a really tightly bought packet. Also, even with leaving my packet in for 30 seconds I got less white than you did with your baby blanket. As for specific colors, I also should have probably consulted the Rit Dye Studio formulas, because they base theirs off 1 cup of water (I think), and I just sort of eyeballed it. If you want a specific color or strength, I might do my homework better on their website. I loved the color I got with Navy (more of an indigo! ), but I felt like I had zero control over the color because I was just sort of winging it (shocking that, that happened, I know). This is straight up amazing and I really want to try it. My favorite color combo is the emerald, teal and evening blue. Ive been meaning to try this for forever! Love! 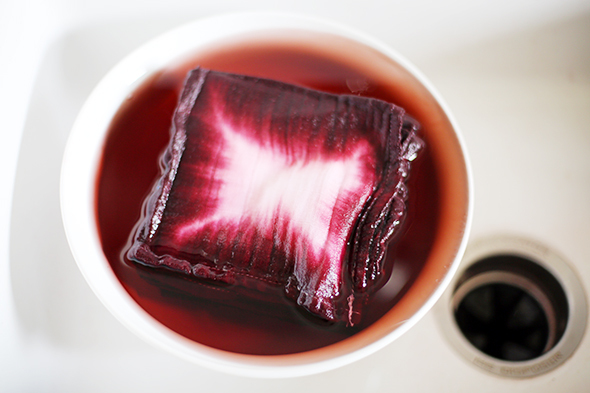 Love the shibori project, can’t wait to try it myself. The things running through my mind. So glad I found this blog post. I’ve done 3 projects so far and I am trying to figure out how the keep the bound part white after rinsing? Once I rinse to clear and then take project to wash it just bleeds, looks cool, but not the look I’m going for. Did you let the project dry completely and then wash to “set” the pattern? I was wondering how this works too…I think it has to do with how thin your fabric is so how tightly you can make your folds, and then how tightly you bind the package. I think the thicker the fabric, the harder it is to make the tight folks and binds, so the more it bleeds. I had a plain cotton canvas pillow case and I left it in 1 min the first time and 30 seconds the second and the 30 seconds had far more white, but not nearly as thin of lines as Jenny got. If you could leave it in the dye for only 15 seconds, but intensify the dye a ton so it gives vibrancy even though you aren’t leaving it in very long that might be a good thing to try. My color lightened at least 50% after I washed, but I didn’t get much more additional bleeding, so bleeding wasn’t the problem for me as much as getting the dye to not bleed into the fabric during the dying process. 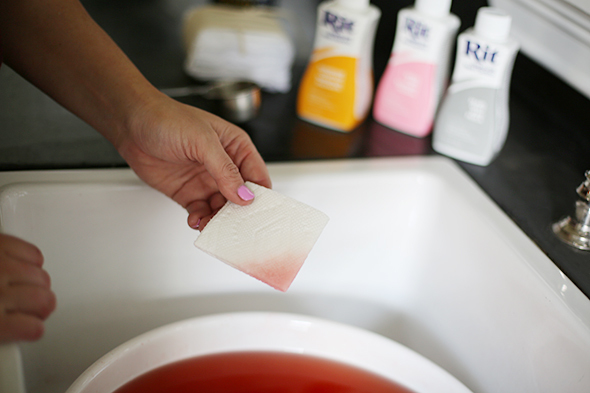 RIT also recommended a Dye Fixative, which may help with bleeding. This is Jennifer Reilly again! I think I left out a y in my email address on the comment I just poseted. Oops! Gonna include the right one this time! Sorry! That is so good! I really want to try and I hope it will be easy for me. Congrats for the post. I can’t wait to try this! I love the pink, blue and purple tones. I SO want to do this for pillows in my new house!! I want to have my girlfriends over and do this! Drink some rose and get creative!!! Can you please share where you bought the white pillow cases from? Thanks! I love this, but I have a question. I love the two “recipes” that give a light green background with peachy pink pattern. I would love to try something like this for my nursery, but does that mix naturally leave the light green or was that dyed beforehand? Thanks for helping me out! Just tried this tonight and i LOVE it!!! a very easy tutorial to follow, my favorite pattern is the according. I did several different colors tonight. Could I throw them all in the wash at the same time or should I do it by color? Thank you! Can’t wait to try this! Thank you so much for this awesome tutorial. Great design sense you have. I am thankful for the robux on roblox and it is not easy as shibori tutorials. You are so talented &so generous in sharing with your followers. This is a great tutorial & you simplify the directions enabling each to follow at their own pace with confidence. This is so useful for us.